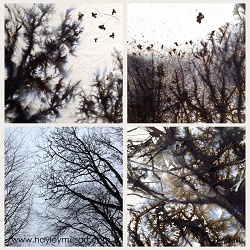 "Thoroughly enjoyed my inky adventure day! I'd have no problem recommending it to anyone who'd love to explore ink or simply have some arty fun. The setting is beautiful, the workshop spacious, Hayley's tutorage encompassing …. 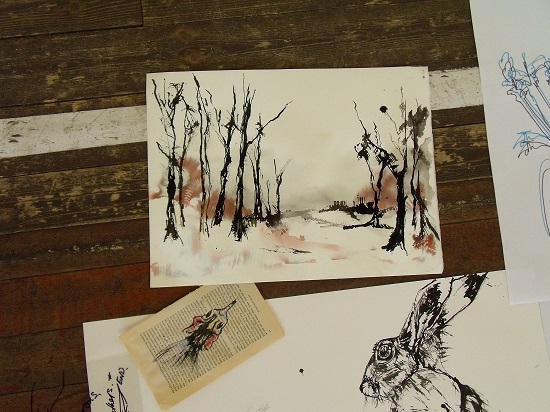 The inky adventure workshop is so much fun you don't even realise it's a workshop. ……. I can't recommend it highly enough." 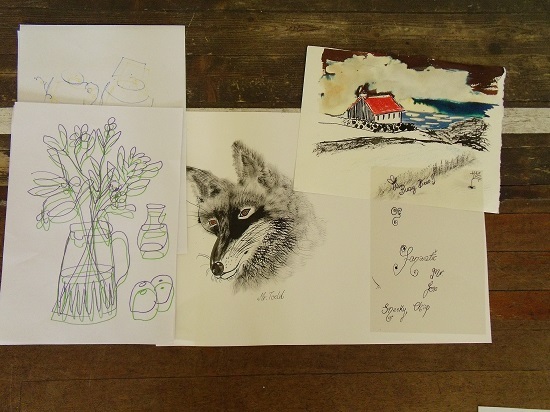 *FULLY BOOKED* 'Mixed Media Drawing'	- Saturday 22 September - 10am-1pm, The Studio, Monimail, Fife, KY15 7RJ - This session will give folks the opportunity to try out some mixed media drawing. It will introduce some mixed media techniques and ideas, encouraging thinking about how to capture nature and landscape with a variety of artistic media. Cost £30 - Materials included. "Thoroughly enjoyed my inky adventure day! I'd have no problem recommending it to anyone who'd love to explore ink or simply have some arty fun. The setting is beautiful, the workshop spacious, Hayley's tutorage encompassing and fun. 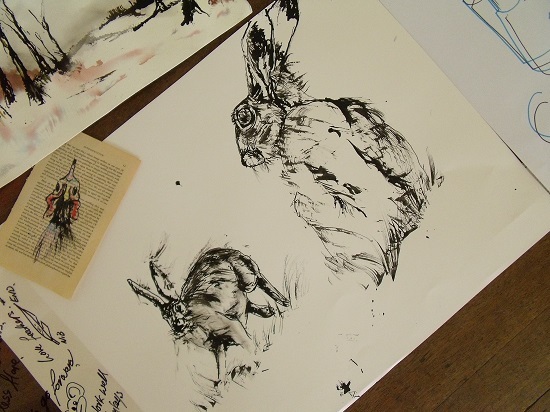 The inky adventure workshop is so much fun you don't even realise it's a workshop. It's a small group of eight friends having fun. I can't recommend it highly enough." 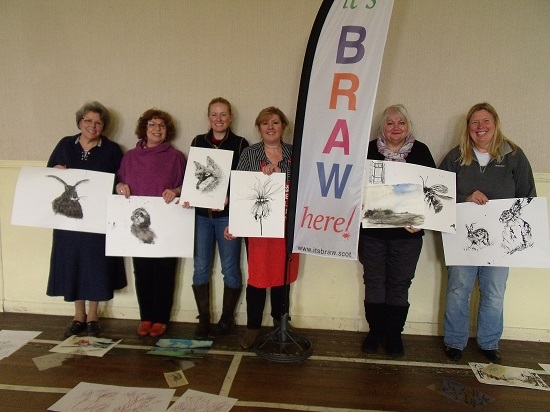 'Mixed Media Drawing'	- Thursday 9 August - 10am -12.30pm, Blairgowrie Parish Church, Blairgowrie, Perthshire - This session will give folks the opportunity to try out some mixed media drawing. 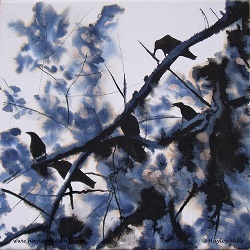 It will introduce some mixed media techniques and ideas, encouraging thinking about how to capture nature and landscape with a variety of artistic media. Cost £30 - Materials included. This workshop is part of the It's BRAW Arts Week. 'Journey into Trees' - Saturday 29 September - 10am - 4pm, The Studio, Monimail, Fife - this workshop will take us on a journey to artistically capture what fascinates us about trees and woodland. There will be some outdoor sketching/collecting of source material, some looking at and developing the source material, and also creation of some ideas pieces to take forward ourselves. Cost £60 - some materials included - bring materials you like to sketch and work with, but be prepared to try something new!